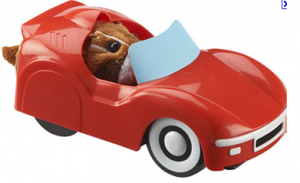 Sporting rodents li ke to drive roadsters, but their little vehicles can fill up with rain when left out overnight. Try removing one side of a cardboard box and putting it outside next to the dustbins so they can park under cover, thus preventing uneccessary water damage to the upholstery. Note: Readers wishing to purchase the roadster shown can find a suitable supplier by clicking on the picture. 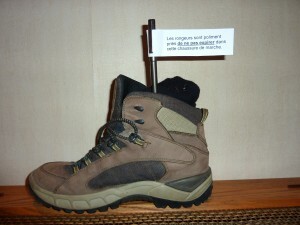 French rambling rodents often like to snuggle down in a comfortable walking boot after a days hiking, particularly if the boot contains a wool hiking sock. Sometimes however, the day’s endeavours, or possibly a good dose of rat poison, can cause the little fellow to die in situ. 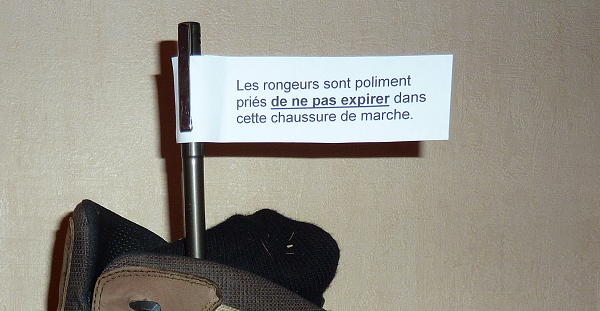 To avoid appalling stench caused by dead rodent in the hiking boot misery, try putting a small advisory sign in the boot. This of course should be in French. A suitable sign is shown on the left, and an enlargement can be obtained by clicking the picture. 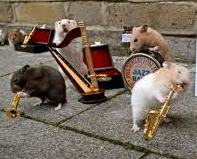 Small rodent-based jazz bands often have to busk to support their musical hobby. However, large english coins are too big for their little collecting cups. Smaller foreign coins can be used, but many shopkeepers refuse to accept small foreign coins from rodents. As a valued alternative, try printing out tiny, signed photographs of Count Basie, and drop these in their cups instead. However, do not economize by printing tiny photos of James Last, as domestic jazz rodents do not favour his continental easy-listening stylings. 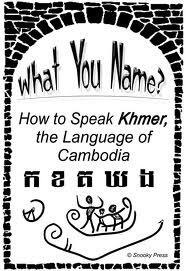 Looking for a title for your Cambodian-English phrasebook of aggressive language?